V1.7 Beta still does not remember Crop Tool settings or allow a favourite Crop Tool setting. I have not bothered using V1.6.5 because of this omission, and will certainly not be using V1.7 (when it is released) unless this feature has been included. At present, using this product to crop a batch of photographs to, say, 6"x4" is an inefficient and time-wasting process. But, for example, I often need to crop many photographs to 6:4 ratio. Whether a ratio can be saved as a favourite or a default is not my concern. I would like to be able to select, say, 6:4 and then have it automatically applied at least during the one editing session. I see the point. I prefer 3:2 ratio and shoot my images in that. Now it's "unconstrained" everytime. Saving the last used selection should not be too hard. I'm sure this is a low hanging fruit. Ich rufe die Crop-Funktion auf und erhalte Bild Crop_01. 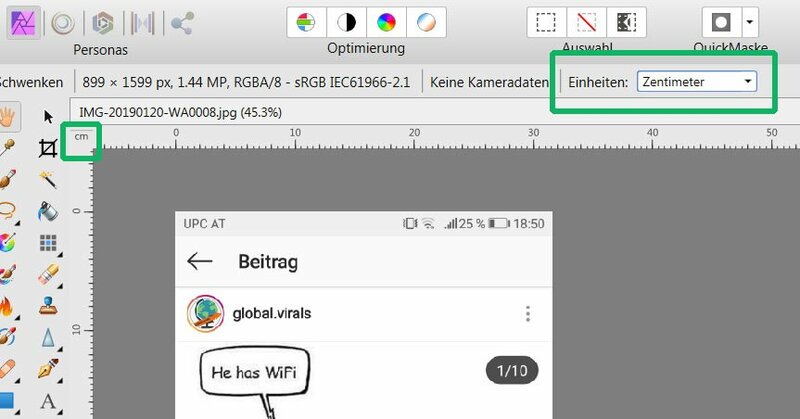 Die Größenanzeigen sind in Pixel (px). Dann ändere ich von 'uneingeschränkt' auf 'Absolute Größe'. In das nächste Feld gebe ich '10' ein für Höhe 10 cm. 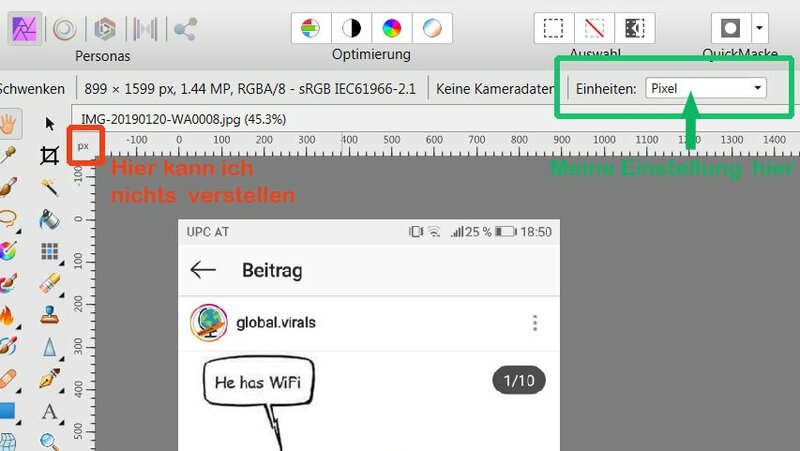 Dabei springt die Eingabe von 13,33 px auf 13,3 px !! verändert. Die Zuschnittgröße steht auf 13 x 10 px. Das darf doch nicht wahr sein! 1. Eingabe bei "Einheiten' Zentimeter. Das war noch in Ordnung. 2. Eingabe 13,33 für die Breite. 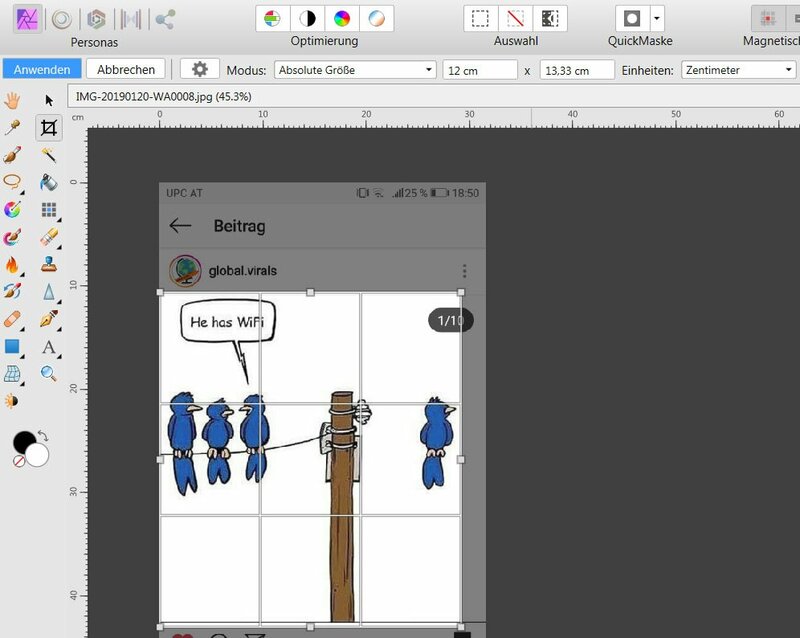 Darauf werden die Einheiten wieder auf Pixel umgestellt. ich musste wieder damit beginnen, alle Eingaben mit den gleichen Problemen einzugeben. Folgearbeiten wieder aufrufen könnte. Es ist der gleiche Wunsch, den Ron Potter hat und der auch schon in der Version 1.6.5. sehr oft geäussert wurde. Seh ich durchaus ein. Außerdem war es lustig zu lesen. Eine mögliche Lösung ist unter dem Thread 'Vorgabe für "Zuschneiden" erstellen' zu finden. Ja, aber erwarte nicht all zu viele Antworten wenn du auf Deutsch schreibst. Sind zwar so einige hier, aber die meisten werden das wohl nicht durch google translate schicken. Für die französischen Beiträge hier mache ich mir auch nicht die Mühe. 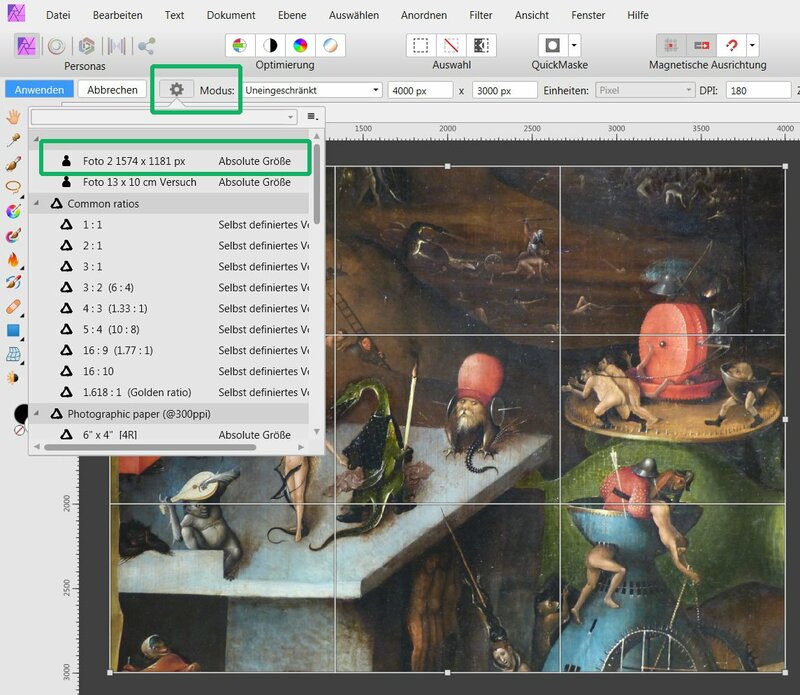 A possible solution can be found under the topic 'Vorgabe für "Zuschneiden" = 'Create preset for Cropping'. I only have understand the main issue, but the details I've missed due to the fact that my German is not that good anymore. I was looking for an answer on how to create presets for cropping. A lot of things don't work as I imaging based on the experience I have with Photoshop. - the creation of a preset for Absolute Dimensions is not accepted, it has the same ratio as the first preset. What am I doing wrong, I can't find no help function for this, no instruction, nor a tutorial. Reading the forum it is an issue but I have no idea where to find 'Create preset for Cropping'. 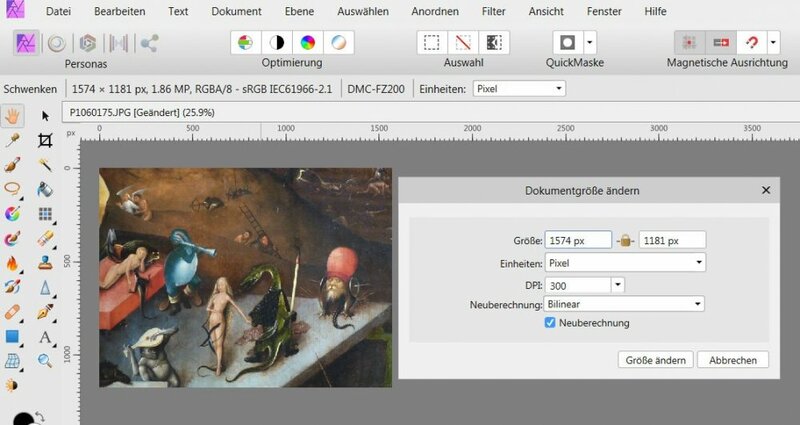 fast alle Fotos werden in px dimensioniert. 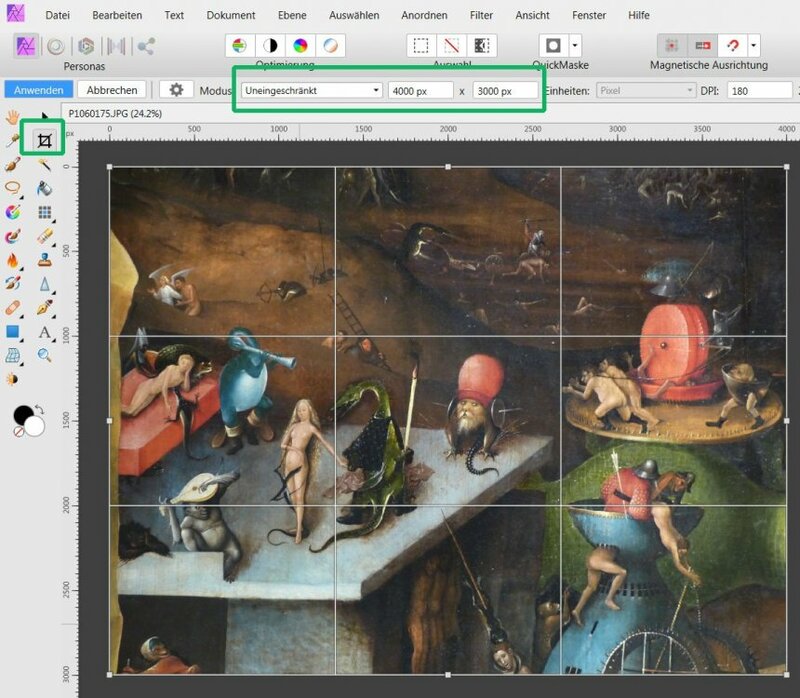 so ist es nicht verwunderlich, das Affinity-Photo die Fotogröße in px angibt. Dann werden die gewünschten Einheiten angezeigt und wechseln nicht zu px. Das wirkt nicht auf Mac, nicht im 1.6 und auch nicht im 1.7 Beta. or so, thank you for the tip. I think Guzzi disturbs it, that the units constantly change from centimeters to px. almost all photos are dimensioned in px. 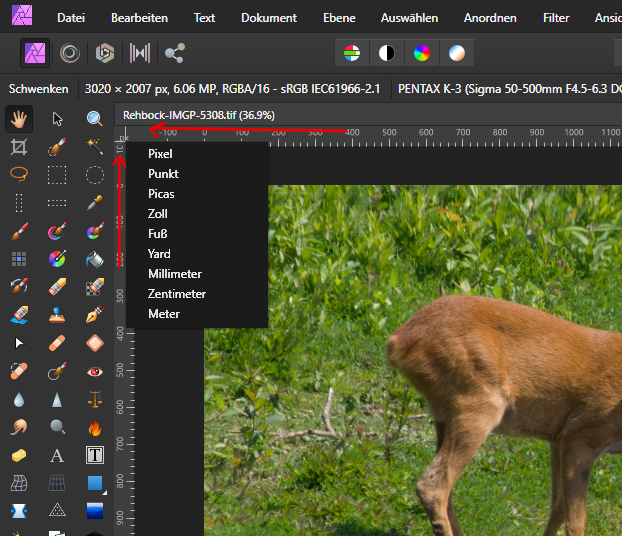 so it is not surprising that the affinity photo indicates the photo size in px. Then the desired units are displayed and do not change to px. I have created a preset in 'Mode', which I have to call again for each photo. Ich habe unter 'Modus' eine Vorgabe erstellt, die ich allerdings bei jedem Foto neu aufrufen muss. In AP beta 1.7.109 it's working fine in millimeters too. 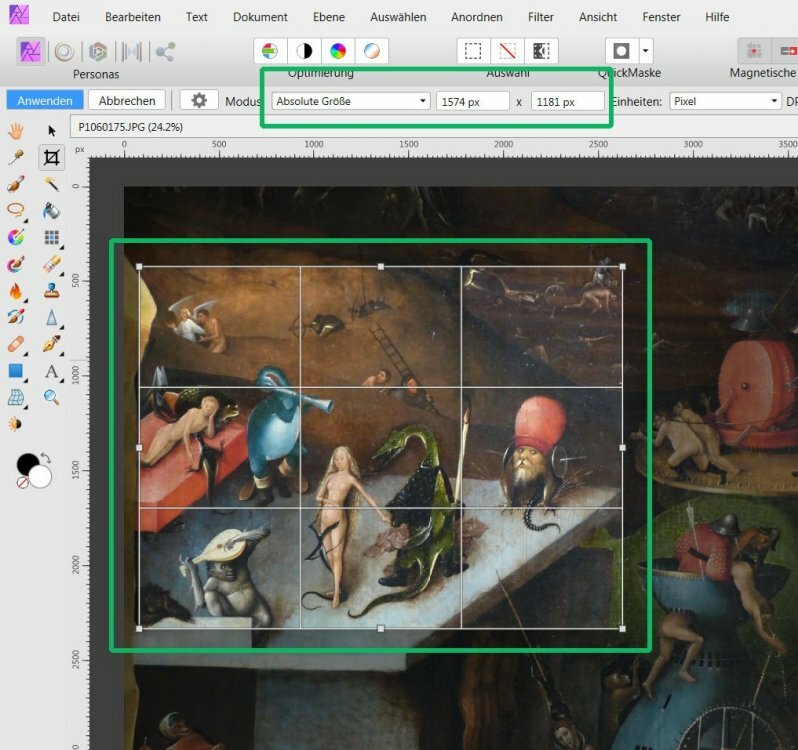 After clicking the crop tool you choose Absolute Size and first you put the units on Millimeters, then you choose DPI and the dimension you like to have. When that data is put in you can easily create a preset, which you have to choose for each photo again as you already stated. Thanks for your message, but it's all so hard. I've set the default to millimeters and as soon as I enter something, I'm back at Pixel. I spend a lot of time on things that are not working as they should. It spoils the enjoyment of this program. Danke für Deine Nachricht, aber Es ist alles so mühsam. Ich habe die Voreinstellung auf Millimeter gemacht und kaum gebe ich etwas ein, bin ich wieder bei Pixel. Ich verschwende sehr viel Zeit für Dinge, die nicht so funktionieren wie sie sollen. Es verdirbt einem die Freude an diesem Programm. I think you have found a bug. I will confirm and get it logged into our database to be looked at as soon as possible. Sorry about that. I will try and address the other workflow things reported on this thread too. There is an option to create a preset, but (at least in Windows) it's not working currently. You cick the cog icon (left of Mode) and then the hamburger menu on the presets dialog. This sounds very positive and I (and Ron and all the others) would be very happy if this mistake and the associated difficulties were corrected very soon. Das klingt sehr positiv und es würde mich (und Ron und all die anderen) sehr freuen, wenn dieser Fehler und die damit verbundenen Schwierigkeiten sehr bald behoben würden. I found it yesterday, I'm using 1.6 and 1.7 both and I didn't see the extra button which was added.